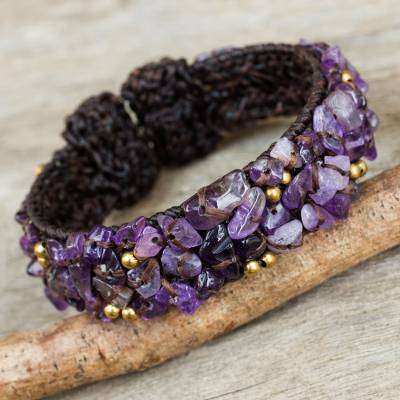 You can find amethyst cuff bracelet 'Violet Twilight' by Tiraphan Hasub in jewelry categories such as Bohemian Bracelets, Birthstone Bracelets, Amethyst Bracelets, Polyester Bracelets, Cuff Bracelets and Beaded Bracelets. Enjoy exploring these sections for other Novica treasures. The variations in purples in this are stunning. Absolutely gorgeous piece. Absolutely breathtaking, the workmanship is Bar None top of the line! I was so excited when I opened it and I can tell you that I just love it so much. There's so many different variations of colors of amethyst so it can go with just about any amethyst piece that you already own. You definitely have a customer for life ! Am delighted to report this bracelet is very elegant! The attention to detail is obvious and I'm so glad I ordered it!! "A birthday gift for my bestie"
This amethyst bracelet is made so well, and the stones are beautiful! Great artistic ability here! This is a lovely, well designed bracelot. I love purple and this is a beautiful accessory! I am very pleased with the beauty and quality of the amethyst bracelet I purchased for my daughter in law. I know she will love it! Received my beautiful 'Violet Twilight' today.One of my favourite amongst the 3 I bought.What is unique about this bracelet is the way it blends with the surrounding light and showing off different arrays of violet.It snugs on the wrist perfectly.Thank you Tiraphan for a beautiful creation.Its beauty is worth a purchase and worth a show off too!